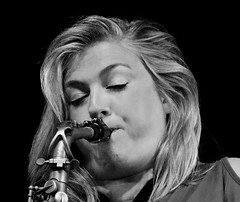 Edinburgh Jazz Festival: International Bands. July 2012. 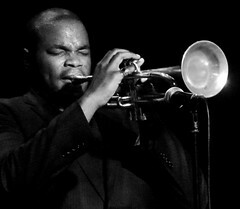 The one EJF gig that didn’t work for me was the Jeremy Pelt Quintet’s headlining show. It might have been because it was in a tent and there was a lot of spillage from neighbouring gigs; or because it was a windy evening – which, coupled with the tent, caused a lot of interfering flappage; or maybe because the band were jetlagged. Whatever, it didn’t really catch. I don’t think it help that the following first chorus was a long bass solo. It just felt like the show lacked energy. There were two gigs which mixed up Scottish and European musicians. First up was Laura MacDonald and Joakim Milder, together with Mattias Stahl on vibes. Stahl stole the show: the two saxophonists played some lovely music, but the vibraphonist stole the show. Without a pianist or drummer, much of the rhythm-duties fell on Stahl’s shoulders. Trumpeter Colin Steele and pianist Dave Milligan – one of Scottish jazz’s little known heros – played an all too short duet – just a couple of numbers, which left me feeling a little short changed (Steele and Milligan work very well together!). 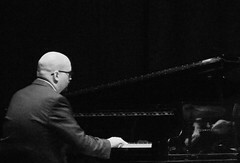 Before, that is, Enzo Favata and his trio took to the stage and opened the way for something more interesting still. 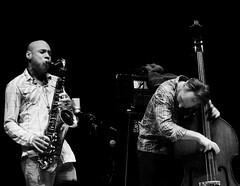 With Danilo Gallo on bass and U. T. Gandhi on drums, the saxophonist lead an energetic exploration of the space between jazz and folk improvisation, with music with its roots in (he said) Sardinia and southern Italy. 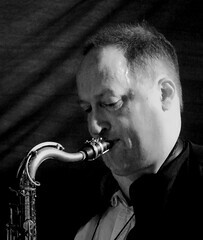 It got more interesting still when the trio was joined by Steele and Milligan for a full set of exciting jazz. 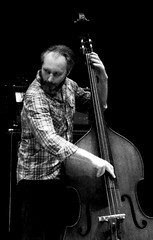 Much of Steele’s music is tinged with folk from the celtic fringes – his big band Stramash is active at the crossroads between jazz and folk – and Milligan has played in many folk settings. Together as a quintet, playing tunes from both their repertoire, they proved music as a universal language: each brought something different, to create an evening that felt unique. Steele and Favata had a natural ease together – their styles, though different, blended superbly. This was exciting because it was unexpected. 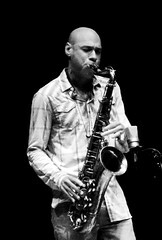 This entry was posted in Jazz and tagged Colin Steele, Dave King, Dave Milligan, EJF, Enza Favata, Ethan Iverson, Jeremy Pelt, Joachim Milder, Joshua Redman, Laura MacDonald, Mattias Stahl, Reid Anderson, The Bad Plus, The Queen's Hall on September 6, 2012 by patrickhadfield.